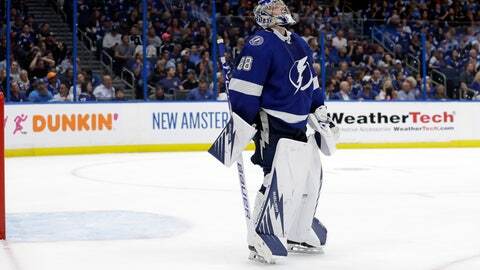 That all changed as fast as the Lightning squandered a three-goal lead before losing 4-3 to the Columbus Blue Jackets in Game 1 of their first-round series Wednesday night. Now a team that lost consecutive games just twice all season must rebound in Game 2 at home on Friday night (7 p.m. EDT, CNBC) or be in danger of a quick playoff exit following their spectacular run. The Blue Jackets were the sixth NHL team to come back from being down at least three goals to beat a No. 1 seed in a postseason game. A comeback seemed farfetched when they fell behind 3-0 in the first period. But Columbus rallied when Nick Foligno scored on a breakaway in the second period following an errant pass by Ryan McDonagh. The Blue Jackets then scored three times in the third, tying it on a short-handed goal by Josh Anderson and getting the go-ahead goal on the power play from Seth Jones with 5:55 remaining. Building on that won’t be easy against a star-studded team featuring scoring champion Nikita Kucherov, Steven Stamkos and goalie Andrei Vasilevskiy. Star center Sidney Crosby, who was held off the score sheet in the opener, wasn’t surprised by the close game. Holding on to leads was a problem all season for Winnipeg so maybe it shouldn’t have been a surprise it happened again in the playoff opener for the Jets.